LAKELAND, Fla. – Florida Polytechnic University has signed historic education agreements with organizations in Brazil and Morocco as part of its efforts to recruit international students to the university. The memoranda of understanding (MOUs) will help the universities develop student and faculty exchange programs, student internships, and joint research projects. The MOU with the Centro Universitário de Brusque (UNIFEBE) in Brazil creates study abroad opportunities between the university and Florida Poly. The MOUs with organizations in the Kingdom of Morocco create partnerships with the Dahkla Oued Dahab region of the country for academic and scientific studies, as well as study abroad programs with Al Akhawayn University. The MOU with UNIFEBE will enhance relations between Florida Poly and Brazil’s Center for Technology and Innovation in Manufacturing. 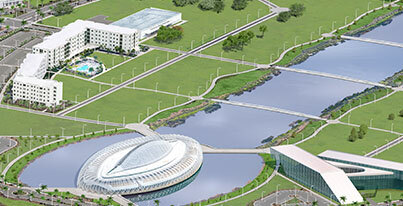 That center plays a pivotal role in tourism, transportation and technology industries in Brazil – and will provide research and internship opportunities for Florida Poly students and faculty. Florida Poly and Al Akhawayn University, as well as the Dahkla Oued Dahab region of Morocco, developed their partnerships due to several shared interests – such as tourism, agriculture and phosphate. Morocco was the first country in the world to mine phosphate and currently holds about 75 percent of the world’s known phosphate reserves. Polk County, home to Florida Poly, is well known for its phosphate mining, and Florida Poly is home to the Florida Industrial and Phosphate Research Institute. The two partners hope that phosphate mining and research will be an area of future collaboration.